A nomadic tribe exists deep in the vastness of space, calling a rogue celestial object home. Their Skywatchers have seen another lonely object that will cross paths with theirs, so they begin preparation for a great exodus from their home planet. This is their species' tenth exodus, to which legend gave them the name Planet Walkers. If two celestial objects cross paths close enough, could a creature jump between them and survive? The rogue celestial objects are not planets. They are asteroids. The "Planet Walkers" live inside this asteroid. The lack of atmosphere or magnetic fields on asteroids mean that they can accrue a large electrical charge from the solar wind. Creative use of the electrical phenomena around asteroids will put some space between the shenanigans of the planet walkers and cruel Newtonian physics, and make for fun and engaging fiction. "For example, understanding the electrical environment around an asteroid could help identify locations where astronauts can safely make first contact with the object," said co-author William Farrell of NASA's Goddard Space Flight Center in Greenbelt, Maryland. "If an astronaut is tethered to a spacecraft that is in sunlight and positively charged, and touches a negatively charged asteroid surface in shadow, there could be an unexpected current flow between the two systems upon contact. We simply can't speculate on the nature of that current without this model." The electrical charge on asteroids can produce attraction or repulsion through empty space, and be strong enough to overcome the pull of gravity. One can even see this on earth, where static electricity can pull an object up off the ground. In dry airless space static charges can become very large. 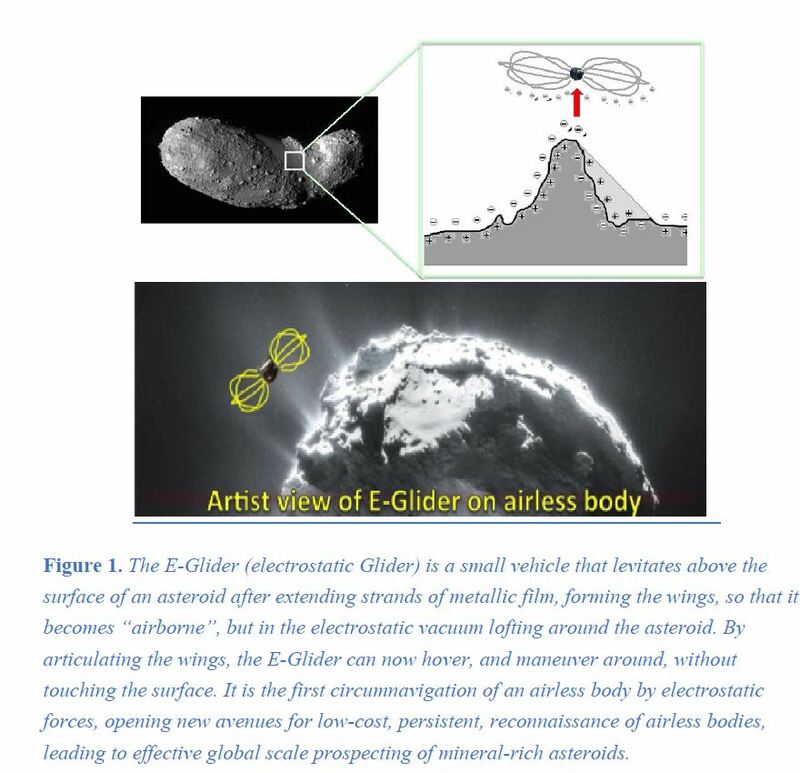 NASA has a scheme for an "E-glider" - a spacecraft which makes use of these electrostatic forces around asteroids to maneuver. So in this scenario, the Planet Walkers manipulate electrostatic forces as artificial gravity on their low-mass asteroid. These same electrostatic forces are what allows a near miss between their home and their new destination - as they closely approach they repel each other. The Planet Walkers use the near miss to make their jump and by altering the electrical charge on their own bodies, are reeled in by the departing lonely object. As others have commented, two objects large enough to have significant gravity will either destroy each other or become one large blob (in a cataclysmic event) when they get anywhere near each other. If the objects are small, like 2 asteroids, they won't tear each other apart. However, asteroids don't have atmosphere, which makes life impossible (as far as we know). Also, the meager gravity would give your creatures the tendency to float off into space and die if they didn't hold on all the time. No, if the objects are sufficiently close and moving at a relative speed in relation to each other that would make a jump survivable, gravity would either make them collide or send them into an eventual collision. If moving fast enough that velocity is sufficiently greater than the gravitational forces to keep moving without being trapped or colliding, then the jump would not be survivable. However your people have already done this successfully 9 times, so they can counter this problem with their technology. I'm thinking along the lines of using magnetic forces somehow to make it feasible, but the details are beyond what we can do. Not the answer you're looking for? Browse other questions tagged science-based reality-check space or ask your own question. VERY dense asteroid belt - possible? Alternative to gravity inside a Dyson Sphere? What would block a planet from seeing the stars? Would walkers work on airless worlds?